Ricardus Simmons (Anglice Richard Simmons, natus Novae Aureliae die 12 Iulii 1948) est docens habilitatis, histrio, comicus, scriptor, choragusque pellicularum Americanus. Fautoribus amissionem ponderis suadet, praesertim per Sweatin' to the Oldies, congeriem pellicularum aerobicarum, ac personalitate inusitate, florida, speciosa, impigra innotuit. Simmons natus est Milton Teagle Simmons, filius alter Leonardi Douglas Simmons et Shirley May Simmons (natae Satin), parentium in negotio spectaculorum implicatorum. In Quadrato Francico Novae Aureliae educatus est, patre Methodista, matre Iudaea ex Russia orta. Simmons Scholam Superiorem Cordis Iesu (Cor Jesu High School) frequentavit, hodie Brother Martin High School appellatam. Universitatem Ludovicianam Lafayettensem frequentavit antequam gradum A.B. in arte in Universitate Civica Floridensi adeptus est. Reach for Fitness: A Special Book of Exercises for the Physically Challenged. 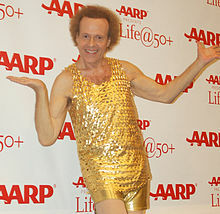 Richard Simmons' Never Give Up: Inspirations, Reflections, Stories of Hope. Sweetie Pie: The Richard Simmons Private Collection of Dazzling Desserts. Simmons, Richard. 1999. Still Hungry after All These Years: My Story. Novi Eboraci: GT Publishing Corporation. ISBN 978-1577193562. Amazon.com. ↑ IMDb, "Richard Simmons," accessus 3 Decembris 2018. ↑ "The Day - Google News Archive Search" . ↑ The Denver Postdenverpost.com. "Richard Simmons' many secrets". The Denver Post . ↑ Bynum, Chris (3 Octobris 2008). "New Orleans native Richard Simmons moves 'em at Harrah's". The Times-Picayune . ↑ Briscoe, Jake (24 Martii 24, 2017). "What Happened to Richard Simmons - 2018 Update - Gazette Review" (renovatus 3 Ianuarii 2018). Vicimedia Communia plura habent quae ad Ricardum Simmons spectant. Novissima mutatio die 30 Ianuarii 2019 hora 12:28 facta.